After settling in the area around Maun in 1915, the Batawana population slowly increased in numbers, and with that, the number of cattle they kept to feed their growing nation. Gradually the cattle encroached upon the free-roaming wildlife in the area, and combined with uncontrolled hunting, wildlife numbers declined rapidly. In 1963, under leadership of Chief Moremi III’s wife, Mrs. Moremi, the Batawana proclaimed the Moremi Game Reserve in order to protect the wildlife of the Okavango Delta. It was the first reserve in Africa established by local residents and not colonial authorities. At first it consisted only of a triangular piece of mopane-forested dry land stretching between today’s North Gate, Xakanaxa and South Gate camps, called the Mopane Tongue. In the 70s, Chief’s Island (the royal hunting grounds of Kgosi Moremi) was added; the addition of the northwestern strip of land between the Jao and Nqoga rivers in 1992, increased the reserve's size to 3 900 km². 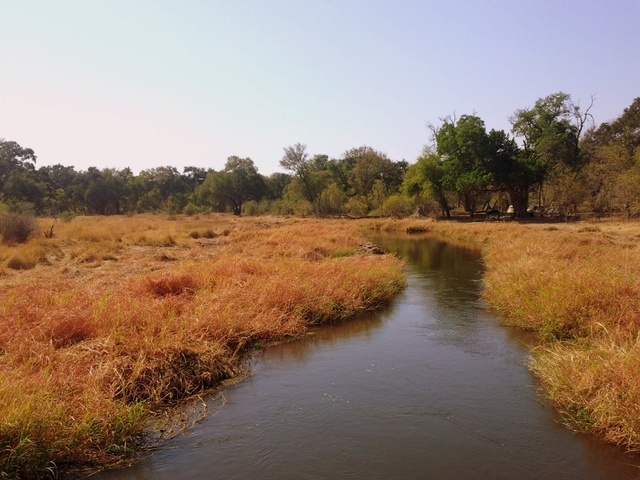 The Okavango Delta forms approximately 70% of the reserve, dry land accounting for just 30%. While there are a number of luxury lodges in the reserve, self-drive travellers can overnight in one of four rest camps. These camps are run by private operators (Xomae Sites, Kwalate Safaris and SKL camps) and pre-booking is essential. Camps aren’t fenced so game (including predators and elephant) often roam nearby - and sometimes through – the camp. Travellers need to be aware of how to react in the presence of dangerous game to avoid life-threatening situations. Hyena commonly enter camps at night scrounging for leftovers, while baboons and monkeys will raid any unattended food and dishes during the day. It’s recommended that you store all food and valuables in your vehicle or trailer, and keep the doors closed and locked when unattended. There is no petrol or diesel available in the reserve. The nearest fuel is in Maun, 90km from South Gate, or Muchenje, 210km from North Gate, via Savute. The sandy roads and water crossings increase your vehicle’s fuel consumption by 50 - 100%, and possibly even more if you’re towing a heavy trailer, so it’s essential to take additional fuel supplies if you plan to travel from Moremi northwards to Savute and Chobe. Moremi Game Reserve has two entrance gates, South Gate (near Maun) and North Gate (near Khwai). The park headquarters is situated at North Gate. Mokoro trips on the Delta are offered by Xomae Sites who run the Third Bridge camp but it’s advisable to book beforehand. Motorboat trips launch from Xakanaxa Boat Station, and a sunset cruise from here is an exquisite way to end a day in Moremi. Mboma Island Boat Station runs both motorboat and mokoro trips. It’s essential to book as they run short on fuel for the boats, and will then only cater for pre-booked clients. Park fees are still payable to the Department of Wildlife and National Parks, and can be paid at North Gate or South Gate in cash (BWP only) or by Visa or Master Card in Maun or Kasane at the DWNP offices. Your entry fees into Moremi is BWP120 per person per day, and BWP50 per vehicle - the cost is the same whether you pay daily or for a few days, you just save the admin! It may be possible to ask for a “multi day” pass if you are not staying in the park. You can only pay cash at the entry gate in Botswana Pula, so be sure to take the right amount in cash (BWP). (Info updated 2018). The roads in Moremi are 4WD tracks, usually sandy and often under water when the Delta floods between May and October. Two-wheel-drive vehicles should not attempt to drive these roads. First, Second, Third and Fourth Bridge are simple wooden structures over deeper channels in Moremi, and are often under water or broken and in a state of disrepair. Travellers should investigate the condition of the bridges and depth of the water before blindly crossing over, especially First and Second Bridge. Just remember to be on the lookout for hippos, crocodiles, elephant etc. while you do! Travellers should be self-sufficient with regards to fuel, food and water. A small shop in Khwai Village, outside North Gate Entrance, sells basics such as cold drinks, beer, flour and sometimes bread. DWNP Maun: +267 686 1265. Kwalate Safaris: +267 686 1448. SKL Camps: +267 686 5365. Fishing is not allowed in the Game Reserve. Phone the Department of Wildlife Tourism office in Maun +267 686 1265 for information on the Reserve. Be sure to buy plenty of firewood before leaving Maun/Kasane, as you are not always allowed to pick up firewood in the parks. Bridge. Less adventurous travellers will find it easier to travel from South Gate to Xakanaxa and then on to Third Bridge.